Dance 8:30-12:00 - Finger food and dessert potluck at break. There is not first or second Saturday dance in August. OCDC Dances resume Sept 8. There is not first or second Saturday dance in July. OCDC Dances resume Sept 8. Annual Fundraiser Dance, Potluck and Silent Auction. May 27, no Riffraff dance, Go to Folklife! Silent Auction Fundraiser & Potluck 5:45-7:20. Workshop at 7, Dance begins at 7:30. April 1, No dance in Olympia. Dance at Wells Hall in Tacoma April 2 in the afternoon. Jun. 11, Susan Burke, Julie Bennett, Jay Finkelstein, caller Gwen Rousseau. 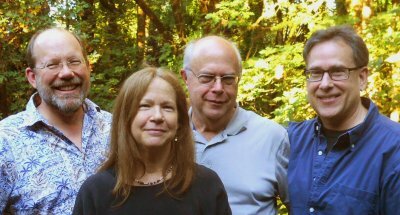 See Olympia Volunteer String Band photo on the "Bands" page. Special New Year's dance schedule 9-12, at the grange! - Dessert potluck at break. May 24, No May Riffraff dance. Dance to them at Folklife.